This wouldn’t fit in a tweet so here goes (pretty much all of the following references were originally via Kathy Sierra). In terms of learning and expertise The Cambridge Handbook of Expertise and Expert Performance provides a decent coverage of current research. Or, if you want a more high-level overview The Talent Code does a decent job once you get past its Gladwellisms. Also related is The Oxford Handbook of Human Motivation (motivation is a huge factor in how we learn and develop skills). Or, again, if you want a more high-level overview, Drive: The Surprising Truth About What Motivates Us does a decent job, again, provided you get past its Gladwellisms. More important is the entire field of UX and Information Architecture (seriously, just pick any one of the major texts) because an ebook is nothing more than a bundled website that doesn’t control its own navigation or the visual representation of its structure. It is the ebook reading app’s responsibility to expose the book’s marked up information architecture in the UI in a way that helps readers build a cognitive map of the book’s structure, which is essential for memory. None of our current ebook reading apps do this. 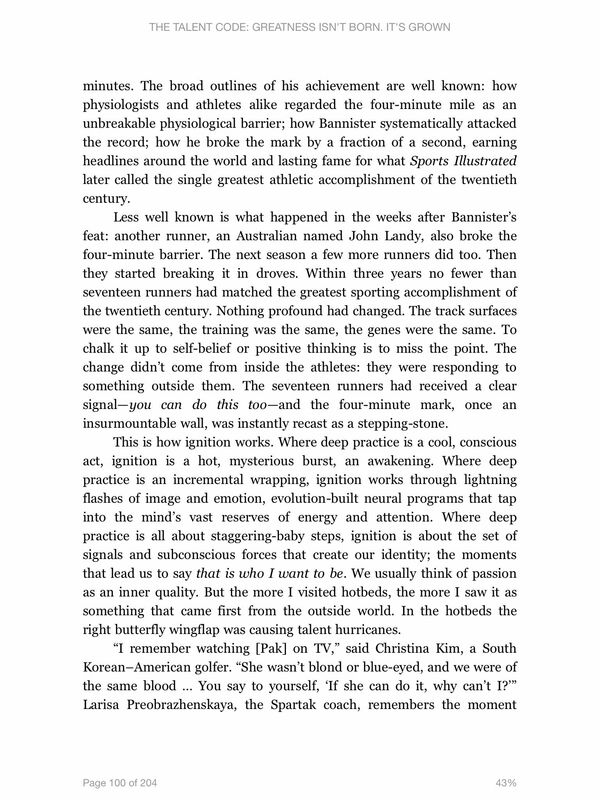 iBooks presents us with the title and page numbers as running headers and footers, which is useless. In terms of helping the reader orient themselves in the book’s structure it’s exactly like browsing a website that offers no navigation. Ebook formats expose landmarks, detailed outlines of the book’s structure, and more through the navigation HTML file and basic metadata. And yet, the makers of ebook reading apps think that hiding all of this information behind pop-up windows or in mystery meat menus in the name of ‘minimalism’ and being ‘distraction-free’ somehow serves the reader. It doesn’t. A print book embodies a host of structural cues that help people build a cognitive map of its structure. It often complements that by having informative running headers that change depending on which chapter (or even sub-chapter) you are in. Ebook reading apps today respond to the removal of those physical structural cues by actually stripping out the few cues they can still offer (like useful running headers). …helps exactly nobody. The UI for eink Kindles is even worse as they don’t even have a running header for the title. On iPhones the running header devolves into a couple of words from the title and an ellipsis. This is crap. There is no way for the reader to orient themselves in the ebook’s structure from these UIs. Wayfinding is non-existent. This inhibits learning and navigation, and this is even before we get onto the subject of possibly integrating ideas from research on skills development or motivation. Unless current ebook reading apps get their act together and fix these issues, all they will be good for is reading novels.